Here we are again with yet another fabulous sketch from our sketch queen, Selene. As soon as I saw this one, I knew exactly what I wanted to do with it - I even got my card made EARLY! Amazing, eh? We'd love it if you would play along with us this week - just go to the Stamping 411 blog and upload your project using Mr. Linky. Now, here are some details about my card. I took a piece of Dusty Durango cardstock and cut it in half at 4 1/4" x 11. It was folded in half to make a card sized at 4 1/4" x 5 1/2". I then ran it through my Big Shot machine with one of the Texturz Plates to give it the ridged background. 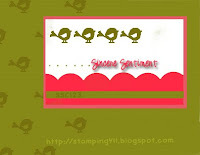 Next, I stamped the wheat stems from the Autumn Days stamp set (told you I was using it a LOT!) down the left side with Dusty Durango ink and then sponged on some more Dusty Durango across the whole card front to make the texture stand out a bit more. The focal point is a piece of Old Olive cardstock folded up to enclose the bottom of the piece of Naturals Ivory cardstock. I tore the folded edge of the Old Olive to distress it a bit and then sponged some Old Olive ink on all the edges to age it somewhat. The Naturals Ivory piece was stamped with the leaf from Autumn Days in Ruby Red, Crushed Curry and Dusty Durango. I did use my Stamp-A-Ma-Jig to line up the leaves perfectly. I then took my Paper Piercer and the Mat Pack to create the holes under the leaves. It's easy to line them up when you use the template in the Mat Pack. The greeting is from the Teeny Tiny Wishes stamp set and is stamped in Old Olive ink. Before I layered my pieces, I used the Ticket Corner Punch on them both to add some more interest to this area. I've found that even simple cards can benefit from little details like this one. It gives them more of a designer feel. The final touch for the focal point was wrapping Hemp Twine around the bottom area and securing the ends in the back. I then gathered the three strands together with a piece of Dusty Durango Polka-Dotted Ribbon tied in a single knot. This entire panel was popped up on Stampin' Dimensionals to give it depth. Not to leave the inside naked, I took another piece of Naturals Ivory cardstock and sponged the edges with Dusty Durango ink, then I added a few Wheat stems in the same color to the left corner. There is plenty of room to write a nice message to your recipient. I'm so glad you stopped by today to visit! I'd love to hear your thoughts on this card, so leave me a comment if you have a minute! And be sure to go make your own card with this super sketch. We at Stamping 411 LOVE to see your take on the sketches each week. It's been so good lately we've had a hard time picking our showcase cards! Great job players! Have a fun and safe evening tonight and don't eat too much candy! So pretty. I especially love the ribbon tied onto the hemp twine. It's the perfect touch for this autumn card. I love, love, love this. I will be casing this next week for a workshop. It's fabulous! Wonderful Thanksgiving card, Robin! Great job! I love that you showed an inside view! The front is gorgeous, I really like that texture and your three leaves are just perfect. I like the angle that you changed them, they look like falling leaves (which are almost a thing of the past here in New England). Beautiful work miss Robin! gorgeous! love the combination of techniques and colors! Very pretty card Robin!!! I love the colors!!! I'm starting to get inspired again to create cards just by looking at your ideas!! Keep them coming!! What an awesome card Robin!!! I love it!! You really nailed this sketch!! this card is so rich and tactile and I know have to use my Autumn Days leaves.... your card has just the right amount of distressing detail and the ribbon tied to the twine was genius. gorgeous card. Love the idea of the texture plate. Makes me think of tree bark. It all goes together perfectly.